WASHINGTON — The Supreme Court has upheld a lower court ruling that struck down 28 state House and Senate districts in North Carolina because they violated the rights of black voters. 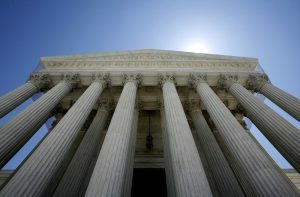 But the justices rejected the court’s order to redraw the districts and hold a special election. Democrats need to capture three House seats or six Senate seats currently held by Republicans to eliminate the GOP’s veto-proof majorities. That would enhance the power of Democratic Gov. Roy Cooper. The high court’s action follows last month’s ruling in which the justices struck down two North Carolina congressional districts because they diminished the voting strength of the state’s black residents. The districts were initially drawn in 2011 when Republicans controlled the legislature, as they do now. Civil rights groups and black voters challenged the districts, complaining that they packed too many black voters into some districts to make surrounding districts whiter and thus more likely to elect Republicans.